Hello, I'm Vi. 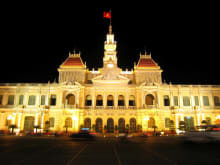 I'm born and raised in Vietnam and I love to show people my country and the beautiful environment that I live in. My passion is traveling and tasting different kinds of foods from all over the world and I believe Vietnamese cuisine and culture is very unique and that every traveler should have a chance to appreciate the true beauty of this country. I will show you places that would otherwise be difficult for you to find. Let me help you create a memorable journey around the country! This was an amazing tour with our fabulous host Vi. She was very knowledgable and friendly and had the day planned to perfection. We had mainly taxi rides with an appropriate amount of walking to view the historical and interesting sites of Ho chi MInh . 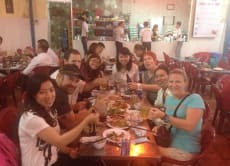 Tour also includes a lovely lunch to taste the delicious foods of Vietnam. My partner and I had a lovely day and worth every penny. Truly a very sweet and down to earth host who aims to please. Took this Mekong Delta private tour last week and my cousin and I thoroughly enjoyed ourselves! As we were short of time, we requested for half-a-day Mekong Delta tour and some other tourist spots such as the Notre Dam Cathedral, War Remnants Museum etc to be done in a day and Vi managed to customised the tour perfectly without making us feel like it was a rush at each place. And even though we had to start our day early, Tina, our very delightful and energetic host kept us entertained throughout the whole tour! We learned a lot about the Vietnamase history and culture through her. Overall, it was a great experience that one can never forget and would definitely recommend Vi for those who would like to visit Vietnam! Althout there was a lot of rain during our tour, we still managed to have a good time. Note for parents - better take baby carrier as the pram is a bit useless on this tour. and if you are safety conscious bring your own baby life jacket as teher was none provided for my 1 year old son on this tour but we did not mind too much. The main comment is that the highlights of the tour were too short! The food in the restaurant was very average as not as tasty as traditional vietnamese food but teh restaurant was set in a beautiful location. Finally there were too many stops at tourists attarctions to purchase local products and not eanough of the traditional life in the mekong delta. Overall teh tour is ok but would not recommend it. Anyway Thank you Vi for a nice welcome to this tour.